Honey, of course, goes nicely with your morning toast, scone or crumpet. But the gooey treat can also help to reverse bacterial resistance to antibiotics, a growing concern in the medical community. At the 247th National Meeting of the American Chemical Society (ACS), held in Dallas this March, the world’s largest scientific society of researchers reported on the newly discovered properties of honey, among other advances in medical science. Basically, honey’s combination of hydrogen peroxide, acidity, high sugar concentration and polyphenols — what’s called an osmotic effect — subtracts water from bacterial cells, dehydrating and killing them altogether. “(Within honey) lies the ability to fight infection on multiple levels, making it more difficult for bacteria to develop resistance,” Susan M. Meschwitz, who headed up the ACS’s study, told Medical News Today. She added that unlike conventional antibiotics, honey doesn’t target the essential growth processes of bacteria, which typically results in that bacteria building up resistance to drugs. Produced by honeybees using the nectar from flowers, honey is made up of glucose and fructose containing about 70 to 80 percent sugar. That’s why it tastes so sweet! It also contains high levels of minerals, such as iron, calcium, phosphate, sodium chlorine, potassium and magnesium. Water, meanwhile, makes up the rest of its composition. Honey has been consumed for thousands of years, and the possible health benefits of the condiment have been reported by scientists and philosophers dating back to ancient Greece. 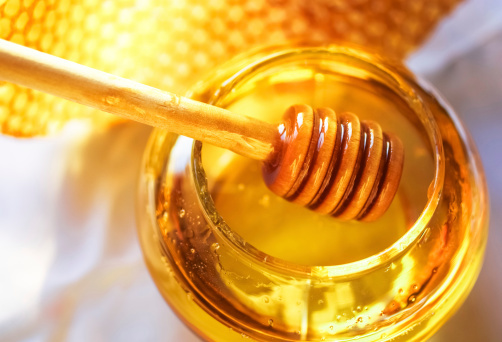 In addition to the management of chronic wounds and burns, as well as the treatment of material imbalances in the body, honey may aid in the prevention of gastroesophageal reflux disease. Also known as acid reflux, this is where the stomach acid comes up from the stomach and into the esophagus, adversely affecting it. Honey has also been used in the oral re-hydration solution for the infantile gastroenteritis virus, which irritates and inflames the gastrointestinal tract, causing nausea, vomiting, diarrhea and dehydration; in the treatment of seasonal allergies; and in the alleviation and reduction of coughs. Today, Meschwitz and her research team are running other standard tests on honey. In addition to having antibacterial properties, as recently confirmed by the ACS, honey is found to contain antioxidants. These mostly come from fresh fruits and vegetables. They prevent the oxidation of other molecules in the body while removing free radicals from the bloodstream. When left unchallenged, free radicals can lead to a wide variety of illnesses and chronic diseases. Of course, further studies of the health benefits of honey are still needed. But for now, it looks to be one sweet solution.